The Tetra-POD by Agri-Plastics is a big, capable ATV trailer with a split personality. 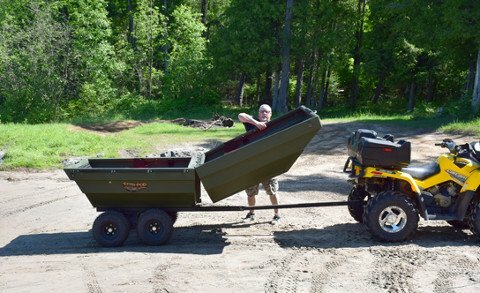 It can haul tons of gear, tools, and debris as an open or enclosed box, but with a few simple steps if transforms – when the lid swings down to join the trailer body – becoming a boat that’s ready for motoring on the open water. This sturdy trailer-boat is especially well-suited for anglers: they can haul their fishing gear through rough terrain to distant waters, and on arrival at their destination transform the trailer to a boat in just minutes to enjoy a day of fishing. Tetra-POD was designed as an ATV-towable utility tub trailer, and it’s tough enough to take off-road punishment. It has a rugged roto-molded plastic body that provides 27 cubic feet of storage space and a big 2000 lb. payload. The tub sits on a powder-coated frame and uses a walking beam axle to keep it steady. It can be used with or without its removable locking lid. The design is weather-proof and bear-resistant. At 550 lbs. it’s ready to haul over trails and back country roads, has a dump function, and is a capable partner when you’re ready to carry firewood, hunting equipment, and whatever gear you need with you on outdoor adventures. How easy is the transformation from trailer to boat? It takes about one minute. Pull right up to the water edge with your ATV and extend the frame hitch to make room for the boat. Then remove the gas springs to fully open the lid, rotate the U-shaped connector pins 90 degrees to secure the trailer base to the lid (instead of to the frame) and remove the rear pin. That’s it! The boat can be backed right into the water by the ATV. The boat includes two removable foam seats and is designed for two people and up to 776 lbs. It’s an 11-foot jon boat that the manufacturer recommends being driven by a short leg motor.